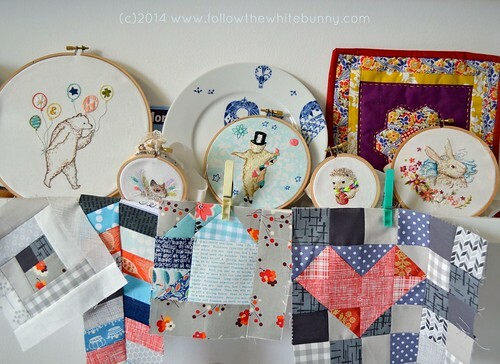 About a month ago I wrote about Lotje's 'Everything but the Kitchen Sink Quilt'. In the past few weeks I already made a few try out blocks which you see pictured (alongside the house block) above. As you can see I'm using a fairly limited palette with grey, blue, orange, white and red. These are colours I associated with Holland. Grey skies, clouds, rain, Delft Blue, the Sea etc etc. I'm definitely going to use some 'typical' Dutch elements too like Windmill blocks. So I hope you feel inspired by this and want to quilt along with us! Or maybe you just would like to see what we're up to in this Quilt Along on our blogs and social media. Look for #doubledutchqal on Instagram and Twitter and you can find the Flickr group here. 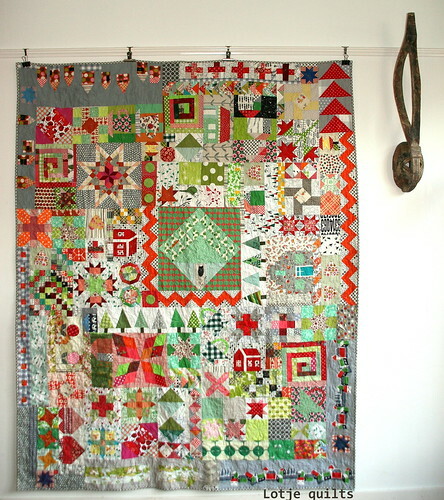 I love the Double Dutch quilt! It's such a quirky mixture. I'm a beginner quilter, but will do my best to join in.